So here is my first blog / news feed. A little bit about whats happening with my art and ideas, experiments, interests and perhaps my plans for the future...... who knows! Released march 2019, a book of Quotes from famous people accompanied by contemporary artwork and a passage from the artist explaining why the quote is relevant to their work. 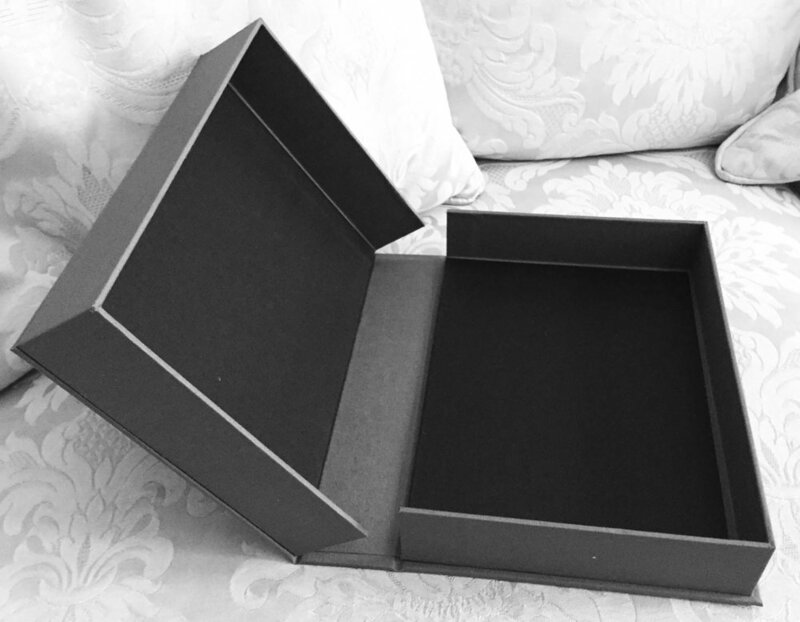 I recently completed a one day course learning to make a solander (clam shell) archival boxes. They can be made in any size, depth or colour required, and are completely acid free, they can be used for storing precious artwork. And are also perfect for presentation of box-sets of limited edition prints, or artists books. They are tricky to make and require some skill and patience, but as they are extremely expensive to buy (as they are generally custom made) its a worthwhile skill for me to learn. If you are interested in learning how to do this I would highly recommend the course I did, it was well organised, well taught and great fun! Courses are run by Lina at ‘WE MAKE BOOKS’ (She also runs courses in making various types of books, which I have also found extremely useful and diverse). Wood engraving is something I have long admired… and so I was delighted that my first real block was not only accepted for the Society of Wood Engravers Annual Exhibition, but that I also won the prize for the ‘Best First Time Exhibitor’ with my ‘Greenwich Park’. I shall now be working my way towards election to the society in the coming years as I build a body of work, as I know wood engraving will be a permanent and essential part of my practice going forward. Below is the article I wrote for the societies quarterly publication, ‘Multiples’. Wood engraving is the tiny sparkling jewel that draws you close to see its wonders, then shows you another universe on a pinhead! Exquisitely crafted in their miniature perfection, often with details so fine it makes it hard to focus your eyes on their every line….. this is something of how wood engraving appeals to me. The detail, the contrast, the depth, the vast range of tones and textures that can be created with just black and white are quite breath-taking, so much from something so simple. Delicate manipulation of the surface of the wood, into a topography of sorts, a landscape of contours, valleys and peaks. A biography of the image, a story in the making, the voice of the wood, and the extension of it’s already seemingly immortal life. This medium that speaks volumes in terms of skill, dedication, patience and concentration, is a sort of stressful meditation. Not long after I had embarked on my first tuition in wood engraving with Anne Desmet at Heatherley School of Fine Art, I was staying at my parent’s house in Wiltshire, and my father asked what sort of wood you use for wood engraving. I explained why boxwood is the preferred option for its tight rings, slow growth and extreme hardness, the necessity for the most perfect of surfaces, plus the relative expense due to all these factors. My father’s response was ‘Oh… do you want some boxwood, I have quite a lot of it, it’s been in the garage for 29 years!’ The story is that several box trees came down in a storm in the winter of 1989, my father being a gamekeeper came across them in the woods and decided to trim and bring the three main trunks home to dry out and season in the garage. For what purpose at that time I do not know, and neither does he. I was only 19 at the time and it was the year I moved to London to start my BA in fashion design, in which career I persisted and made my living for 25 years. Now it seems I have a good supply of boxwood, that comes from the woods around which I grew up, there seems some wonderful serendipity in that alone. So perhaps wood engraving was always meant to be… I have bought a range of tools but the ones I like the best are those I have been given, used by a previous wood engraver who died not so long ago, (I’m still trying to find out who she was). But I suppose my newer tools will never reach this status if I don’t use them and improve my skills with their help, to make them worthy of passing on at some future time. So I am, supplied with wood, tools and boundless inspiration in the trees that are already part of my etching and drawing practice. Plus, I have found that wood engravers (certainly all the ones I have met without exception) are generous people with kind encouragement and good advice to help me on my journey. When your subject matter is almost exclusively trees, working with wood seems to be the most natural, logical, desirable and even respectful medium, and an appropriate language in which to convey my passion for the subject. (Of course, I’m working on resingrave at the moment, in fear of doing no justice to a precious piece of boxwood… ) The pressure of a deadline is a galvanizing force and antidote to procrastination. And I was determined to get started and do my best to produce something worthy to consider entering for the SWE Annual Exhibition. Although it did take me till the eleventh hour to overcome the intimidation of the discipline. The old tree I chose is a favourite with which I am very familiar, I have visited and drawn it many times. I needed a friend whose contours and structure were going to feel natural to me so that any struggle I may have would only be with the block and the technique, and not a lack of understanding of the image I wanted. I danced around the block (metaphorically speaking) for days until the pressure of the deadline finally forced me into action. I couldn’t bear the thought that another year might go by before I had at least tried to submit a piece work. The print (Greenwich Park III) was already made, as I have a little more experience with woodcuts, but I felt it would not be acceptable to submit a woodcut with no wood engraving to accompany it, after all, it is the Society of Wood Engravers. By the time I had got my act together, cut the block and printed it, the ink had barely time to dry before it was packed up to be submitted in order to meet the deadline. Wood engraving can be quite intimidating, as I am still very much a beginner with a great deal to learn. Every cut is both a decision and a risk, and there is only so long you can hold your breath while you work. I often look admiringly at the work of other engravers for their silent advice, it is both inspiring and frightening. But always with the knowledge that I must find my own voice and language within the medium in order to speak with truth and authenticity about my choice of subject. Wood engraving is a wonderful affliction, and I strongly suspect it’s also an incurable lifetimes obsession. London is not the most ideal location for someone so obsessed by ancient trees but is amazing how many there are within a relatively small thirty or so mile radius of where I live. But it also makes for a wonderful excuse to leave the city on a regular basis in search of these beautiful creatures. My working process always begins as an exploration, a love of being out in the landscape. Walking in woods and forests is entering another world, a place where it is possible to be ‘in the moment’ I find that I hardly think at all when I’m amongst the trees, I look, I feel, I breathe and the world around me seems ‘present’. Its really the only place where this state of being exists for me. I sometimes collect stones, bits of wood, burrs, and twigs fallen from high up, acorns, conkers, galls, leaves and the occasional jay feathers from an unfortunate bird that came to a sticky end. When I come across an ancient tree whether by accident or design, it’s with the excitement of meeting an old and dear friend, in whose company, there is hidden knowledge and secrets of the past witnessed but with no voice to tell the tale. The twisted trunks, the giant burrs, all texture and tactile surfaces, that speak of hundreds of years of growth and decay happening at once, both beauty and beast. They are anthropomorphic to me, invoking my empathy for their endless life, simultaneously mortal and immortal. Black and white is the palette for all my work, even greys don’t really exist, except optically where black is less dense and disintegrates. When working in any medium the tonal quality of an image is already of primary importance to me when considering a subject. Strong sunlight, deep shadows and the play of light, no matter the season help me understand how to translate the drama created by this simple absence of colour. Many of the trees I use as subjects for my work can seem quite unremarkable at a casual glance. And someone one told me that its not so much the subject but how you translate it visually that can make it engaging and intriguing or not… Monochrome is a somewhat unnatural perfection, visually incomplete, and yet it seems to intensify all that is there. January 2018 seems like a long time ago, and in fact I have managed to pack a great deal more into the year than I had originally planned or realised. (These are be benefits of keeping an up to date CV, so you can look back and take stock of what has been achieved… as some things might otherwise have been forgotten. We all seem to be so hard on ourselves these days, so this is a good thing to do, reflect, then move forward). There have been a couple of projects that have led to work going on tours. Tours are a great opportunity to get some of your work travelling to other parts of the country, widening your possible audience but also creating contacts and collaborations. (Print Rebels tour with the Royal Society of Painter-Printmakers, and the Society of Wood engravers annual exhibition which tours right up to the Orkneys). I was also fortunate enough to get work into the Berlin Mini Print, my first chance to exhibit work in Germany. But overall 2018 was a year of showing a great deal more work outside of London. History: - The Print Collectors Club was established in 1921 by the second President Frank Short. Each year 6 members of the Society are selected by the President and the Chairperson of the Print Collectors Club, to form the Print Collectors Club Group. 2018 will also be the bi-centenary and birth year of the founder and 1st President of the RE, Francis Seymour Haden. Membership of the club: is £35, the prints are sold to PCC members for £100. In February 2017 I was elected as an associate member of the Royal Society of Painter-Printmakers. For me a great honor and an ambition... I would say fulfilled, but in reality an ambition that has just begun. Being elected as an associate is just the beginning, the next step will be to be elected a 'Fellow' of the society, but in order for that to happen I need play an active role in the society, and to progress and grow my own practice. Membership of the Society itself has already offered a boost to my practice and visability. The RE holds three annual exhibitions of members work as well as 2 others as 'open calls'. In addition to this during the course of the year other opportunities arise, to be involved in shows with galleries that have fostered links with the RE, and even some overseas organizations building relationships with the RE and Bankside Gallery. Being elected is not a simple or easy matter and is an endorsement of your current practice, the level of technical as well as artistic proficiency achieved.. Thank you RE ! The Royal Society of Painter-Printmakers (RE), were known until 1991 as the Royal Society of Painter-Etchers and Engravers. The RE was established in London in 1880 and given a Royal Charter in 1888. The Society was established for the promotion of original etching as an art form. The first six fellows, all elected on 31 July 1880, were Francis Seymour Haden, Heywood Hardy, Hubert von Herkomer, Alphonse Legros, Robert Walker Macbeth and James Tissot. By 1911 King George V granted a Charter of Incorporation and the Bye-laws. In 1920 the membership was expanded to allow artists who produced prints from media other than metal, which allowed the election of woodcut artists. The Presidents of the Society were: Sir Francis Seymour Haden (1880–1910), Sir Francis Short (1910–1938), Malcolm Osborne (1938–1962), Robert Austin (1962–1970), Paul Drury (1970–1975), Harry Eccleston (1975–1989), and Joseph Winkelman (1989–1995), David Carpanini (1995–2003), Anita Klein (2003–2006), Hilary Paynter (2006–11), Dr Bren Unwin (2011–13) and currently Mychael Barratt (2013–). I joined the Arborealists group in 2015, after seeing their first major exhibition at The Royal West of England Academy in Bristol. I was both surprised and very happy to find a group of people who like myself are 'ever so slightly' obsessed with the idea of portraying the tree in art. And yet we all do it so differently..... this is a big part of why the exhibitions are so powerful and interesting for people to see, and why I personally find the group such and inspiring experience to be a part of. As Arborealist's we come from all different parts of the UK and France. Since 2015 the group has gone from strength to strength, now with almost 50 talented and diverse artists. The shows are increasing too, from an original expectation of perhaps 1 a year, we are now looking at 3 a year, with exhibitions planned in for several years to come! The group seems to have hit on a time when the environment we live in is increasingly coming to the fore of peoples thoughts. And who does not have a memory or experience of a tree somewhere that has touched their lives? We are currently working on a project, looking at Lady Park Woods in the most eastern part of Wales in the beautiful Wye Valley. 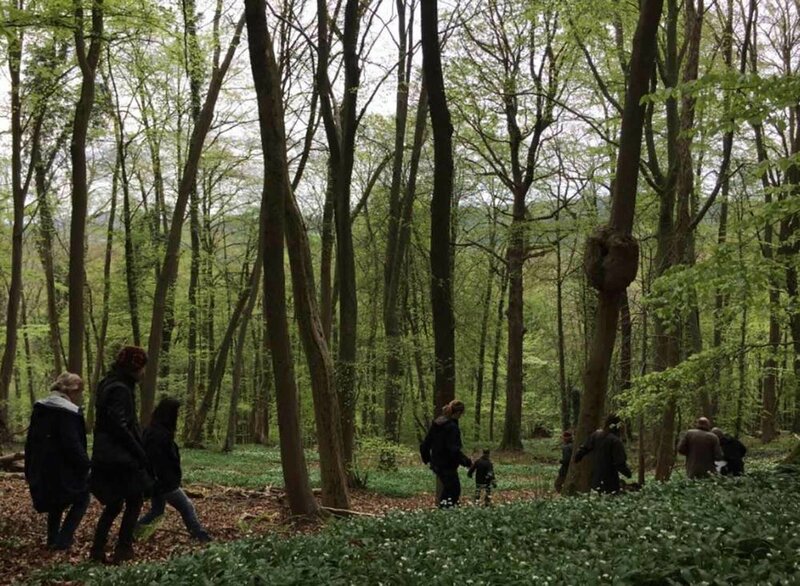 We were invited to observe and draw these woods by George Peterken, the ecologist who is involved in the monitoring and recording of information about the trees and the environment within Lady Park Woods. And who has informed us in some detail about the characteristics of the place, and the nature of how these woods have behaved in recent years. This particular woodland is protected and deliberately 'unmanaged'. It was last coppiced in 1870, then allowed to grow tall. In 1942 it was partly felled for the war effort, but in 1944 the Forestry commission decided to protect the wood for the purpose of studying the natural ecological processes. So it has been left to its own devices for the past 75 years (apart from the fence to keep out the deer). The wood itself is on the steep valley walls downstream from Symonds Yat, and is a veritable vertical landscape, with the impossibly tall tress sitting one above the other all the way to the top. I'm not yet sure how I will respond to this landscape..... I have some ideas, but they need some time...... wait and see!